It was a balmy August night. New York summers are unlike any other. The city seems to swallow up all of the sun's energy during the day and slowly release it at night, engulfing its residents in a veil of heat. But it didn't matter, the city's lights were brightly gliding by as we crossed the Brooklyn bridge. The cool cab was a welcoming respite from the temperature and I took it all in eagerly anticipating the screening of Donnie Darko at the Brooklyn Brewery. During my college years I went through a pretty intense movie obsession phase. When I wasn't buried in books and between nights out, I was getting my movie fix. I mostly had a thing for foreign and indie films. Sure blockbusters were cool, but I liked losing myself in character's lives and more often than not, those intense, complex stories were found in independent films. It seemed to fit my escapist nature. One day a friend mentioned that I really needed to see the movie Donnie Darko. I tend to be hesitant when someone tells me that I "have to" see or read something but decided to give it a shot anyway. And so my sheer infatuation with this film began. I can't say with certainty what did it. It may have been the time in my life, the soundtrack, story or simply the character's lives that had me hooked. It wasn't called a cult film for nothing. We'd arrived and as is typical in my nature, I get overly excited about things I'm into and go overboard. Before the movie even started, I'd had several beers and was busy chatting and chain smoking when the wave of nausea came over me. I caught the opening scene only to spend the next hour or so in the bathroom. Empty stomachs and strong beers are not a good match, I learned. But somehow I miraculously pulled through and managed to catch the last part of the film. In my 20s, I had an absurd ability to hang and recover. That is no longer the case, but those were good days. Despite the earlier episode, I was fine, in fact, I was more than fine - I was starving and felt like I'd gotten a second chance at the night. We decided some food would probably do everyone good. Nearby we spotted a Thai restaurant and decided to make our way over. It was one of the prettiest spaces I'd been in. Whether it was my feeling better and functioning at that point or if the place really was that special, I can't recall, but the colors, shapes and energy were palpable. Everything had a mystifying glow. It was my first time trying Thai food and I distinctly remember that noodle dish. Entering unknown territory is scary but so exciting - a matter of perspective I suppose. That night, my love affair with Thai food began. The noodle dish in front of me had so many layers of flavor and textures that my tastebuds were experiencing nirvana. While today's dish will likely not bring on any such feelings, I try to play around with Thai recipes as much as I can and made a paleo version for you. The crunch from the vegetables and cashews mixed with the gooey creaminess from the almond butter and tahini, will hopefully make you swoon the way it makes me. 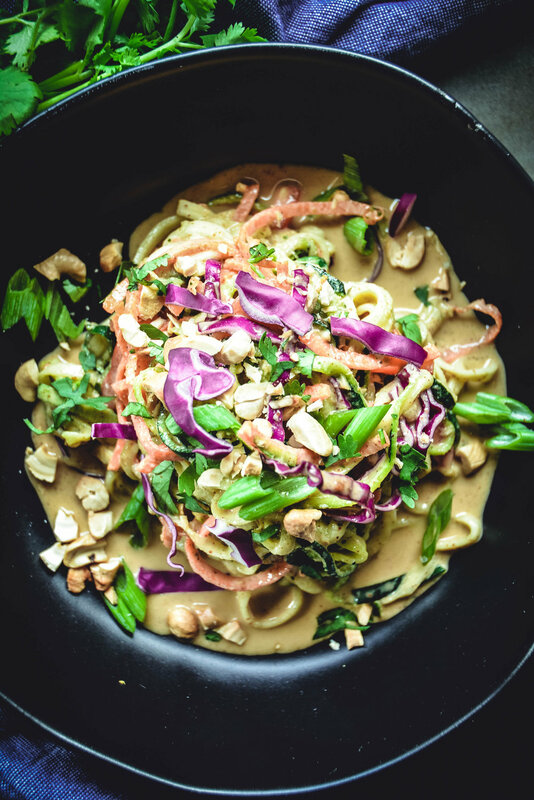 *If you're not paleo, you can easily substitute peanut butter for almond butter, pad Thai noodles for the carrots and zucchini and peanuts for cashews. 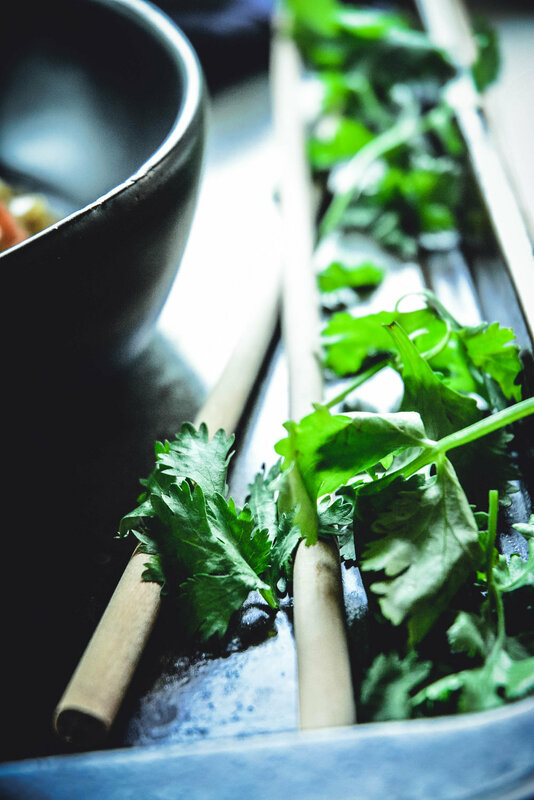 In frying pan add coconut oil, zucchini and carrot spirals and cook, stirring frequently, for 1-2 minutes on medium until the noodles are warm and slightly soft. Remove from heat and set on plate to cool. In mixing bowl combine all ingredients for sauce and mix well. Don't worry if the sauce is a bit thick. Zucchini contains a lot of water and will thin it out. Add zucchini and carrot noodles to sauce as well as cabbage, red pepper, cashews, scallions, cilantro if you'd like Thai or regular basil. Serve right away.